Here we share How to Downgrade OnePlus 3/3T from Android Oreo to Nougat. Recently OnePlus released the latest Android 8.0 Oreo update for OnePlus 3/3T. The update is quite stable, but If you update your phone but don’t like the update for any reason, then you can easily revert OnePlus 3/3T to a lower version (Android Nougat). You need to download Stock Nougat firmware to Downgrade OnePlus 3/3T from Android Oreo to Nougat (Downgrade OnePlus 3/3T from OxygenOS 5.0 to OxygenOS 4.5.1) and the process is very simple. 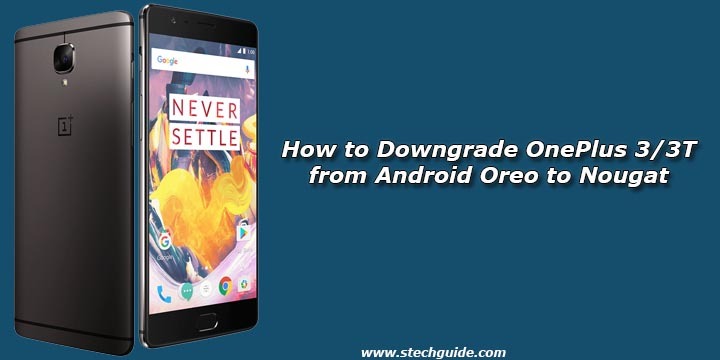 Check below guide to Downgrade OnePlus 3/3T from Android 8.0 Oreo to Android Nougat. Stable Oreo version is available for OnePlus 3/3T but many device owners are still not happy with the update for various reasons. If you are one of the users and would like to Revert OnePlus 3/3T from Android Oreo to the Nougat version, then you are in the right place here we share the method to Downgrade OnePlus 3/3T to Nougat from Android Oreo. Rollback build is used to Downgrade OnePlus 3/3T Oreo Open beta but also work on the Stable build. 4) Download the OnePlus 3/3T Nougat Rollback build and stable OxygenOS firmware from above and copy to a folder where adb installed. 1) Download OnePlus 3/3T Rollback zip and stable OxygenOS zip file from above and save it on your internal phone memory. 2) Shut down your device and enter recovery mode by long pressing the Power + Volume Down key simultaneously. 3) Select “Install from Local” and choose the Rollback build to install. 4) Now reboot your device into recovery mode and Wipe data cache and Erase everything(Music, pics, etc). 5) Reboot your device again. 6) Your device will boot with special Nougat build. Now if you want stable version then repeat step 2-5 from above and this time choose the Stable Oxygen firmware in step 3. 4) Now, Go to Install and locate the OOS 4.5.1 Full Rom Zip & swipe to Install the ROM file. 5) Now reboot your device into recovery mode and perform a Factory reset. The post How to Downgrade OnePlus 3/3T from Android Oreo to Nougat appeared first on Android News.